I'm reposting Tess's comment from the All Eyes on Damascus post, just because it's very apt. "I find it fascinating how differently people choose to report the bombing: which religious sites are near, how quickly it was reported, the rarity of the bombing, the connections to the last bombing in Syria years ago, a prisoner riot, or a meeting with US officials in New York. Reading those quotes, one would have thought that several different events were being reported, based on how differently the material was presented. Trying to imagine some sort of global understanding is difficult when even the most concrete events, such as this bombing which resulted in 17 deaths, can be turned into just about anything." Thanks Tess, welcome to the blog. Eid will be on Wednesday in Syria, Egypt, Turkey, Iran, Iraq, Bahrain, Oman, Morocco, Tunisia, Algeria, Mauritania, Sudan and Pakistan. Eid will be on Tuesday for: Lebanon, Jordan, Saudi, Kuwait, Qatar, the Emirates, Palestine, Yemen, Libya and - controversially - only Iraq's Sunnis. Could the political split be any more obvious? Where was the Damascus bomb? Not near a 'Shia shrine'. Most western media persist in saying the bomb site was "near the Shia shrine of Saida Zeinab". My map clearly shows that is totally misleading. As Orientalista points out, the attack was much closer to the Palestinian/Golani/Iraqi area of Jaramana. And it was actually closer to the "Christian shrines" in the Old City, if we are going to pinpoint everything in religious terms. It was about two kilometers down the airport highway, after you leave the Old City, near Bab Sharqi. It happened at the junction for Jaramana. 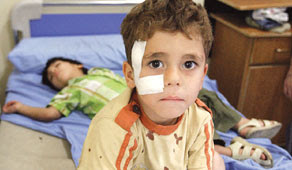 It has been three days since seventeen innocent people were blown to pieces in Damascus. The UN, the United States, Britain, France, Russia, Lebanon, Jordan and most of the world has condemned the attack. But one country is missing. Saudi Arabia has not uttered a single word. The Guardians of the Two Holy Sites have stayed completely silent. They have not said they sympathise with the victim's families. They have not criticised this act of unbelievable terror. Either they are sickeningly rude, or they agree with the bombing. 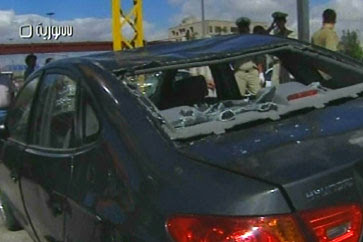 Saturday's bomb on the airport road in Damascus was a suicide attack. A car bomb killed 17 people in the south of the city. The early results of the investigation show that an Islamist terrorist entered Syria on Friday - the day before the attack. He came from a neighbouring Arab country - but authorities are not saying which one. That means it could be Lebanon, Jordan or Iraq. First thoughts will turn to Lebanon, following a report from Britain yesterday claiming that Al Qaeda extremists in Tripoli were planning to attack Syria. At least 5 people have been killed and 17 wounded in a bus bomb in Tripoli. The bus was carrying soldiers. It happened in the Buhsas area of the city during the morning rush hour. It's six weeks since the last bus bomb in the city - which killed 15 people including 10 soldiers. Al-Qaeda allied group Fateh Al Islam has been fighting a two year war with the army in Tripoli. It's claimed Saturday's car bomb in Damascus was carried out by the same group. 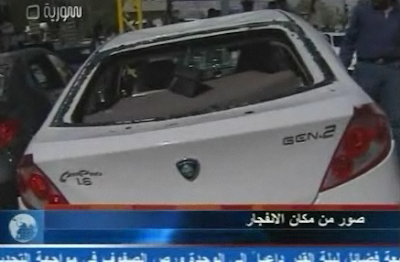 A bomb has gone off in Tripoli. 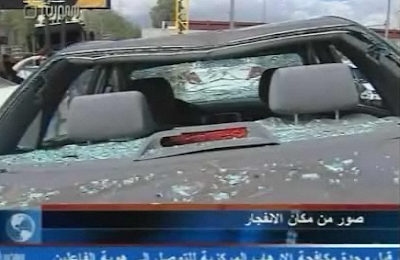 It exploded near a bus carrying Lebanese soldiers. There have been casualties. Tripoli is thought to be a centre for Al Qaeda-supporting terrorists. 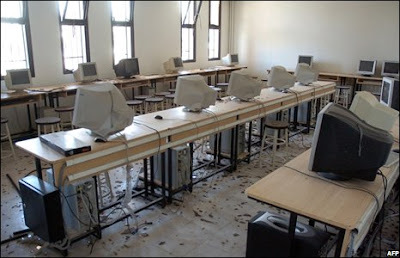 Many have been funded by the Hariri government. Here's what the world is saying about Saturday morning's car bomb in Sayida Zeinab, southern Damascus. 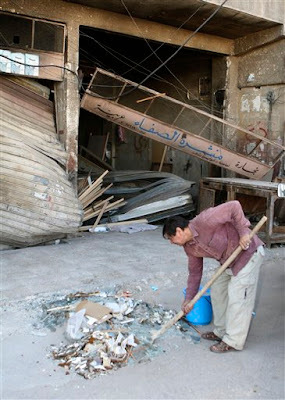 "Seventeen dead in car bomb. This is the kind of headline you'd expect in Iraq, not in Syria." - Hala Gorani, CNN, United States. "It should be said that no American has been killed by terrorists in Syria throughout the entire history of the country." - Syria Comment, United States and Syria. "The apartments lining the crowded streets around the mosque are home to hundreds of thousands of Iraqi refugees, many of them poor, unemployed and undocumented. News reports from Syria said the bombing occurred near a state security post. There were conflicting reports as to the nature of the post, with one opposition web site saying it was no more than a car park used by state security services." - Washington Post, United States. "The security post [near to where the bomb detonated] is not a very important or significant security site; it is for petrol for security patrols. It is very near the Saydah Zeinab shrine. At this time of year during Ramadan, it is very significant. Pilgrims come from Lebanon, Iraq and Iran to visit the shrine. The security post has not been harmed." Al Jazeera, Qatar. "The blast was the deadliest since a spate of attacks in the 1980s blamed on Muslim Brotherhood militants." - Agence France Press, France. "The exiled head of Syria's banned opposition Muslim Brotherhood Ali Sadreddine Bayanouni said the attack could be the work of extremist groups or part of a "struggle between security forces. The security agencies have set up terrorist groups and sent them to neighbouring countries like Lebanon and Iraq. I don't rule out that they have slipped from their control and are carrying out such acts." - Agence France Press, France. "The bombing comes as senior Lebanese military sources told The Observer that jihadis - some based in the Lebanese city of Tripoli - had launched a series of attacks against the Syrian regime of Bashar al-Assad." - The Guardian, Britain. "In recent years, there have been some reported clashes [with the Muslim Brotherhood], with the security forces killing several suspected Islamist militants, and arresting hundreds more." - BBC, Britain. "The bombing also occurred less than three months after Islamist inmates rioted at a prison outside the capital, taking hostages and engaging in gun battles with the authorities, in a confrontation that dragged on for weeks." - New York Times, United States. "The explosion came only hours after Syria's foreign minister held a rare meeting in New York with his American counterpart, Secretary of State Condoleezza Rice." - Associated Press, United States. "Despite claims from Syrian groups that Israel was behind the bombing, political and security officials in Jerusalem [sic - you mean Tel Aviv?] denied any Israeli involvement." - Haaretz, Israel. "Unusually for Syria, whose media is closely policed, details of the attack were reported immediately, with rolling updates on the casualties and investigation." - The Guardian, Britain. Images, top to bottom: AFP, BBC, AP. To the seventeen innocent men and women who left their houses in Saida Zeinab this morning, and never came home. And shame on some people who are suggesting the victims were soldiers and police, who deserved to die. Shame shame shame. Your hunger for power at all costs makes me sick. Crawl back into your hole in Washington DC. It happened on Mahlaq Road, on a junction between the airport road, and the road to Sayida Zeinab. It was 8km from the shrine of Sayida Zeinab. The bomb would have been much more deadly if it happened near to the densely populated area around the shrine. Saturday's car bomb is the worst attack in Syria since 1986. Syria has been the safest country in the region. In the past eleven years, there have been no terror attacks (except for extremist attacks on the American embassy, and an Israeli attack on a few rocks). 1997 - 9 died in a bus bomb in Damascus. 1986, March 17 - 60 died in a truck bomb at a military compound in Damascus. 1981, November 29 - 64 died in a car bomb. Nice to see Agence France Press (AFP) (bottom) stealing images from Syrian Television (top), and then SELLING them. I'm shocked. 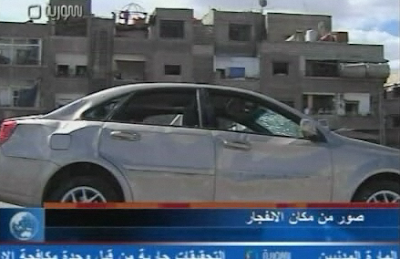 Syrian television has already started showing pictures of the car bomb. When Imad Moughniya was killed in Kafr Souseh in western Damascus, earlier this year, they didn't even MENTION the bomb for a whole day. So, it's been a few minutes since the bomb, and already people are spending their time wishing up conspiracy theories based on their filthy politics, instead of thinking about the fact that seventeen lives have been lost. Just think about the dead - instead of how the attack supports your filthy view of the world. It happened in Mahlaq Road in Sayida Zeinab. Another 14 people have been injured. Sayida Zeinab is the Syrian capital's Iraqi area. Most of the 2 million refugees live there. 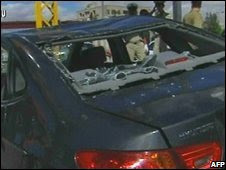 The car was packed with 200kg of explosives. Buildings 100 metres away have had their windows blown out. For the past five and a half years, people have been asking how Iraqis who are killing each other back home, can live side by side in Damascus. 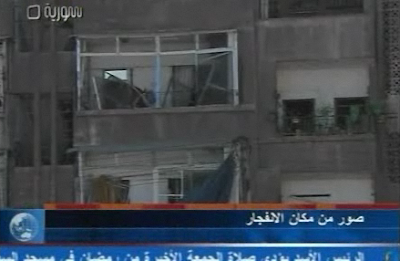 17 people have been killed in a car bomb in southern Damascus. Iran is "at the centre of violence and fanaticism". Iran "holds back chances for peace, while undermining human rights". Iran's actions "postpone the establishment of the Palestinian state." Shimon Peres, ISRAELI Prime Minister. McCain "if elected, would not become actively engaged in Israeli-Palestinian peace efforts and discourage Israeli-Syrian peace efforts". So keeping the region at war is a policy strategy? Is this what makes Americans happy? Syria has passed the tests from the International Atomic Energy Agency (the IAEA). The UN's nuclear watchdog says there is nothing to support America's claims that it was building a secret nuclear reactor in the desert. The tests began following an Israeli air raid on a building which it claimed was being used for a nuclear project. 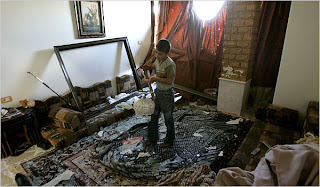 Israel bombed in September 2007. It stayed unusually silent for days, until Syria made the attack public. America waited until April 2008 to make its claims. Washington alleged the site was a nearly finished reactor. They showed pictures which looked identical to a reactor in North Korea (although, the photos could have actually been sites in North Korea). Israel released pictures apparently showing North Koreans in Syria. 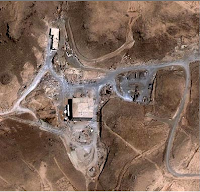 Satellite images showed the site had been leveled after the attack. America was surprised Syria didn't just leave the bombed-out building as it was. But simply removing the bricks and cleaning the ground would not have removed all traces of nuclear material. 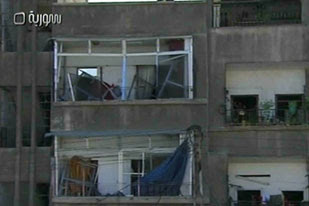 The Israeli explosion would have dispersed the materials for hundreds of meters in tiny amounts. The UN investigation followed soon after the American claims. IAEA investigators were given free access to the site in June 2008. Books@Cafe is coming under attack from the unenlightened. Syrian nationals will be able to apply for British visas in the normal way from next week. Even though the British Embassy has been operational in Damascus, it has been closed to visitors for years, because of the security risk. Anyone wanting to travel to Britain had to apply for a visa through the DHL office. But now, Britain is opening a new Visa Centre in Mezzeh - it will be Britain's second office in Damascus (the other one is the embassy in Maliki). The address is Building 13, Ground Floor, Al Jazaieree Street, Mezzeh West Villas, Damascus. Phone: 612 5270 and 612 5271. It will be open Sunday to Thursday 9am to 4pm. Walid Junblatt is a heartbeat away from joining the Hizbollah-led opposition. Two days after publicly breaking up with his ally of three years, Sa'ad Hariri, his party has had a meeting with Hizbollah. In an interview with the LA Times, he accused Hariri of building his own private army, and supporting religious extremists. He also backpeddled in his previous harsh criticism of Syria and Hizbollah, saying it was all just politics. Now his party is talking to Hizbollah, and preparing to sign a Memorandum of Understanding - a formal document setting out how they will work together. This is what Michel Aoun did two years ago. The PSP (Junblatt's party) is insisting that neither party has changed its positions yet. Samir Jaja, another key March 14 figure has broken ranks, as speculation grows that Saad Hariri will soon be left on his own. Jaja says the Aridi assassination was connected with the previous killings. That's important because Aridi is a pro-Syrian politician - many of the others who have died have been anti-Syrians. So by connecting the two, he is hinting that Syria couldn't be behind them all. He also condemned those who suggest the killings aren't linked. Hariri is one of those who has claimed that Aridi was killed by Al-Qaeda allied groups - and that the other politicians were killed by Syrian agents. The Jaja-Hariri spat comes a day after Walid Junblatt openly criticised Hariri in the LA Times. Walid Junblatt is now openly criticising his March 14 ally Saad Hariri. He has given an interview to the Los Angeles Times. In the interview, he accuses Hariri of trying to build a militia, and allying with religious extremists. And admits his most inflammatory anti-Syrian comments were made just because "politics requires it", implying that he doesn't stand by those opinions now. The March 14 coalition came to power because of the twin pillars - Hariri and Junblatt. But he now realises that they are almost certain to lose their majority - and be thrown out of government - in next year's elections. Junblatt has been making a number of warm comments in Hezbollah's direction since the battles in May 2008. Could this be the start of a new pragmatic allegiance, just like his clever 2005 allegiance with Hariri got him into power? A main figure in Lebanon's opposition has been killed. Druze politician Saleh Aridi has died in a bomb blast in Aley. He was an ally of Hezbollah - and his party (led by Talal Arslan) humiliated Junblatt in the fighting in May. Aley is just outside Beirut, and is considered a stronghold of Walid Junblatt. The two sides were due to come together on Monday to discuss their differences. A bomb has killed Lebanese Druze politician Saleh Aridi. More soon. President Nicolas Sarkozy has opened a French school in Damascus. Sarkozy is aiming to deepen ties between the two countries. 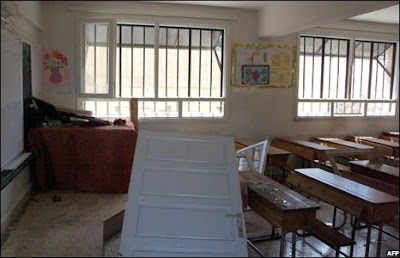 He has opened a school in Damascus, named after Charles de Gaulle. It is making some of the older generation uncomfortable, because they remember France's brutal occupation of Syria. The two countries have also signed a number of huge economic deals. The most important one is an agreement to allow the French oil company Total operate in Syria for the next ten years. For the first time in years, the French tricolour flag covers most main roads in the Syrian capital, for Sarkozy's first visit. It is also the first time a western head of state has come to Damascus for five years. Thanks to Amniya for this. But where were Bashar Al-Assad and Nicolas Sarkozy having dinner. I'd say it looks like the rooftop of Laranja, a new Gemini Group restaurant on Medhat Pasha, near Bab Sharqi. It specialises in dishes from the different regions of Syria. Syria has handed over a document outlining its demands, if a peace-treaty is going to be signed with Israel. It's given the list to Turkey. The next stage is for Israel to hand a similar outline to Turkey. They will provide the starting points for direct negotiations. It comes as the actual negotiations themselves seem like they're slowing down. Israel has lost its chief negotiator, and it's election season in America. The two sides may not be meeting up for a chat - but the wheels on the peace-mobile are speeding up. The Syria-Israel peace talks have been postponed because the Israeli negotiator has resigned. Syria's President Bashar Al-Assad has called the next round "crucial". Hamas has told AFP that Politibureau leader Khaled Meshaal has not left Syria. It was widely reported this morning that he had gone to Sudan after being kicked out of Syria. The problem is these reports all started life in one place: a Kuwaiti newspaper called Al Rai. The paper quoted an unnamed 'reliable' Palestinian source. Kuwaiti papers have developed something of a specialism at selling rumours as fact. As-Siyasseh has become the expert at this. The country's media has targeted Syria before. The question is now not about the Syrian-Israeli peace talks - but more about what Kuwait is playing at. What did it have to gain? There are reports that Hamas Politibureau head Khaled Meshaal has left Syria. 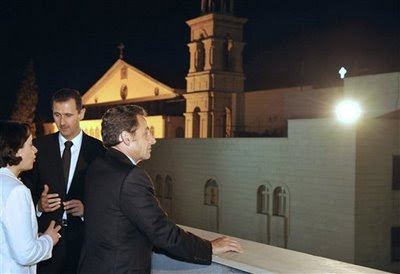 The timing is very interesting - one day before French President Nicolas Sarkozy lands at Damascus Airport. And just as Syria and Israel signal they are ready for direct talks. His presence in Damascus has been a key sticking point in the Israel-Syria talks. Israel says it considers the move a huge sign that Syria is serious about the talks. Syria Today's editor Andrew Tabler has more here.